If you haven't seen this yet, here is a guaranteed way to become the coolest dad on the block. Our good friends at Nerf have perfected the marriage of capture the flag and paintball with their new product Dart Tag. 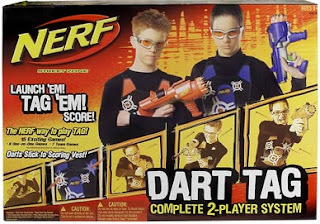 Available in four models, Swarmfire (20 shots), Quick 16 (26 shots), speedload 6 (it is getting pretty obvious at this point) and the Sharp Shot (5 shots) the Dart Tag system was designed to improve upon the old days of "I shot you. No you didn't" technology. With the patented Nerf Dart velcro tipped dart there will be no confusion. The starter set comes with scoring vests as well as "vision gear" (a.k.a. lawsuit avoidance systems). The darts fly far and have a sizable impact, but nothing that is going to hurt anyone. Now image yourself leading the charge down the block with your kids behind you to take on the annoying neighbors down the street. Or being the cool dad that makes a capture the flag field in his backyard with appropriate booby traps and obstacles. And think about the message that you are teaching your kids... with Nerf weapons, all squabbles can be taken care of the way that God had intended it, with styrofoam weapons. Have you tried these out? What did you think?